In this ever-changing world there are timeless principles at work, sometimes beneath the surface, sometimes quite apparent. There are also special creations, enduring pieces of art, that reflect these principles in a way that captures our imagination and turns our attention inward. Flying back home to Canada from a yoga festival in Europe, I was recently reminded of one such piece of art in the form of the classic western film, High Noon. The basic story line is that a town marshal in the American west retires his badge in order to marry a Quaker woman, whose religion forbids violence. No sooner is he married however, then word arrives that an outlaw he had captured years before has been released from prison and is returning with his gang to take revenge. Under these strained circumstances, the man feels compelled to take back his duties as marshal to defend both his future with his wife and the security of the town. As Yogiji relates it, the decline of Indian civilization was arrested by the mission of Guru Nanak, culminating in the rise of Guru Gobind Singh, dedicated to the defence of the good and the uprooting of tyrants, and by the founding of the Khalsa. In his talk, Yogi Bhajan relates how the degradation of society affected the condition of India's women, who were captured by the thousands and sold for a pittance in the slave market of Ghazni, Afghanistan. The heartrending situation is described by Guru Nanak in the Babar Vani, as he witnessed the invasion of Babar. Some have stabbed themselves; some, their spouses killed in battle, cannot sleep. In the early talk, Yogi Bhajan conveys the heart of Sikh teachings. Sikh Dharma, after all, is not a path dedicated to personal salvation alone. It is a meditative way of life dedicated to preserving the essential social conditions of harmony and justice that allow for individuals, families, and communities to flourish and prosper, even when doing so might put one at risk of dying. Grant me, O God, this blessing: May I never refrain from righteous acts. May I fight without fear the foe in life's battle with full confidence in your victory. As the film progresses, the marshal's defence of the town proves increasingly difficult. His wife urges him to flee and start a new life where they will not be recognized. As he packs his belongings and prepares to leave the judge tells him that the man he sentenced is only coming to kill him and not the marshal, and that the town is not worth defending anyway. The town's previous marshal, now retired, advises him that it takes time for people to appreciate the value of law and order, and that events have taken place too suddenly for them to recognize the need of preserving it. The mayor pleads against a gunfight saying it would hurt the town's reputation. The marshal’s former friends are reluctant to stand by him as they fear for their lives and their families' futures. There is also a telling gender divide in people's response to the marshal's plea for assistance. While the townsmen make excuses, a few even recall with fondness the years of lawlessness before the marshal. The women in the story however are unanimous in appreciating his bringing security to the town. The situation of the town marshal is not that different from the situation faced by Guru Nanak and every great sage of every time. In taking on the bullies and bigots of his time, the great Guru put his own life in danger. 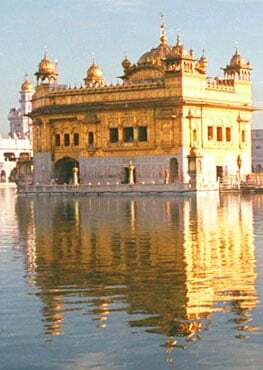 His mission continued through the sacrifices of all his successors, the martyrdoms of the fifth and ninth Gurus, and the legacy of the Khalsa. In each case, brave Sikhs faced down cruel and insolent authority for the sake of peace and righteousness. In no case was it a personal fight. Every time it was an exertion for timeless principles and for the good of all. Compared with men, women are not weak. At their best, they are the inspiration of every home. Women are leaders of conscience, leaders of religion, potential leaders of every walk of life, even war. As our first teachers, everyone relies on their wisdom, patience, and decency. When the home is at peace, life, joy, and creativity abound. But for mothers and children to flourish and blossom, there must be peace and security in the land. In High Noon, as the character of the marshal's wife unfolds, we see that in her life she had been traumatized by the killing of her father and her brother, events which led to her adoption of the nonviolent creed of Quakerism. She is no coward however, and in the end she too conducts herself bravely in the face of great danger. Like Guru Nanak, Yogi Bhajan conducted himself as a feminist. “God lives not in a monastery or a cave, but in a cozy home,” he said. He named the feminine principle “Adi Shakti,” the inspiration of all. Not unlike the great Guru, he took on his teaching mission unasked. Nobody told him to come to the United States and teach Sikh values, spiritual discipline and respect of womankind. His family missed him. His colleagues advised against it. Mostly, he was on his own. Like the marshal in the movie, Yogi Bhajan stuck to his principles. He lived for others, not for himself. He faced betrayal so often it became a common occurrence, one to be expected. But he also kept going, despite every reversal, despite every discouragement he kept on building the foundations of a spiritual nation in the West. Like the great Gurus before him, Yogi Bhajan was sustained and preserved by the eternal spirit of womankind, Pritham Bhagauti. I won't give away the end of the movie except to say that despite every adversity, the marshal stays and awaits the killers coming for their revenge. He writes his will and prepares for the worst, but somehow destiny saves him. And like the true sevadar he is, when his job is done, he gives up his badge and gets out of town. He does not wait for appreciation or congratulations. With his loving wife at his side and the timid townspeople still amazed at the outcome, the marshal just gets out of town.